How are today’s colleges and universities serving as a focal point for social justice issues in the 21st century? Broadly speaking, “social justice” encompasses the principles of equity, opportunity, and non-discrimination, all of which are pertinent to higher education. For example, how can faculty instructors promote an environment of mutual respect in classrooms that are becoming increasingly diverse in terms of culture, ethnicity, religion, sexual orientation, and national origin? What pedagogies are most effective at fostering inclusive engagement of all students? How can we integrate social justice expansively throughout the curriculum, including disciplines like the sciences, where it is not usually found? How can the entire campus community work together to eliminate sexual harassment and assault? Access to quality higher education is another pressing social justice concern. For some students, the ability to attend college has become increasingly elusive because of rising costs. Do our schools provide educational opportunities for a broad diversity of students, including those who are underrepresented and economically disadvantaged? Or is our education system—as some critics claim—simply perpetuating the social and economic stratification that already exists in society? Finally, new advances in networked technology have changed our students’ understanding of the “public sphere.” Social media can be used as a mechanism for positive social change, but they also create a new space for bullying, harassment, and expressions of prejudice. These negative online interactions present a thorny challenge because they occur outside the parameters of the classroom and the educational institution. How can faculty, administrators, and students work together to harness the positive aspects of social media and to foster online civility and respect? 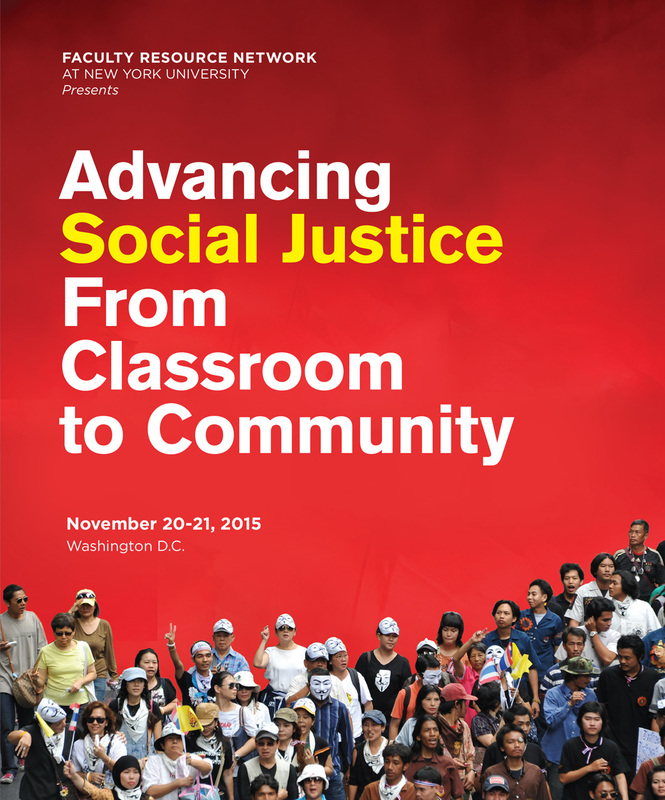 How can social media be used to further social justice both domestically and globally? During this two-day symposium, through keynote presentations, plenary panels, and breakout sessions, we had the opportunity to examine what social justice means in today’s colleges and universities. In this thirteenth issue of our online NETWORK: A Journal of Faculty Development, we present excerpts from a number of the presentations that were delivered during that symposium. Debra Szybinski, Faculty Resource Network, and Beverly Wade Hogan, Tougaloo College. Excerpts from a presentation by Kai Burkins, Johnson C. Smith University, and Dezette C. Johnson, Johnson C. Smith University. Excerpts from a presentation by Ruth Lucier, Bennett College. Excerpts from a presentation by Brenda Bryant, Marygrove College, Jesse Cox, Marygrove College, Karen Dimanche Davis, Marygrove College, Jann Hoge, Marygrove College, Julie Laforet, Marygrove College. Excerpts from a presentation by Noemi Esther Morriberon, Fairfield University. Excerpts from a presentation by Gwendolyn M. Bookman, Bennett College for Women. Excerpts from a presentation by Elizabeth R. OuYang, New York University and Columbia University. Excerpts from a presentation by Lisa Hibbard, Spelman College, Renee Leonard, Spelman College, and Aditi Pai, Spelman College. Excerpts from a presentation by James Peter Lawler, Pace University, and John C. Molluzzo, Pace University. Excerpts from a presentation by Jill O’Sullivan, Farmingdale State College. Excerpts from a presentation by Alexandra Vega, University of Sacred Heart, Puerto Rico. Excerpts from a presentation by Orla Smyth LoPiccolo, Farmingdale State College, SUNY. Excerpts from a presentation by Murdell Walker McFarlin, Clark Atlanta University. Excerpts from a presentation by Beverly L. Kahn, Farmingdale State College. Excerpts from a presentation by Veronica Henry, Farmingdale State College. Excerpts from a presentation by Mentewab Ayalew, Spelman College, Dolores V. Bradley, Spelman College, Kimberly M. Jackson, Spelman College, Yewande Olubummo, Spelman College, Jakita O. Thomas, Spelman College, and Joycelyn Wilson, Spelman College. Universities’ Compliance with Title IX OCR Directives: Do the New Sexual Harassment/Sexual Offense Policies Advance Social Justice? Excerpts from a presentation by Audrey Wolfson Latourette, Stockton University. Excerpts from a presentation by Nicola Davis Bivens, Johnson C. Smith University, Anita Bledsoe-Gardner, Johnson C. Smith University, and Deborah Brown Quick, Johnson C. Smith University. Excerpts from a presentation by Rita Mitchell, Huston-Tillotson University. Excerpts from a presentation by Lynn B. Elfe, Farmingdale State College, and Angela Jones, Farmingdale State College.